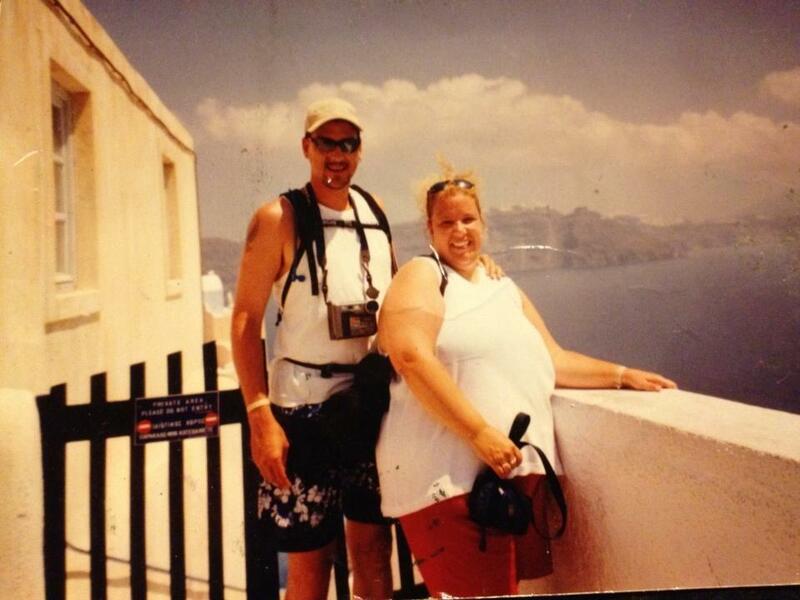 My journey to health started 13 years ago on a hike down canyon in Greece. I had read about this hike in several travel books… It was 11 miles downhill. I thought to my 278 lb self… I can do that… It’s downhill! See, I never really thought of myself was fat. I never saw a fat girl in the mirror. I looked past the fat and saw myself… And thought ” I look good today…” Or ” oh, I’ve got to do something bout those circles under my eyes… ” but never really seeing fat me.. Just me. I did see fat me in pictures… I would look,at the picture and think… “Holy moly! I am fat!” And that picture would go on the fridge and for a few (usually 2) weeks I would see fat me on the fridge and I was good… I didn’t cheat on whatever diet I had decided to try that month. Then I would look past that picture as I reached for something worth way more points that I had left for the day… And eventually the picture was moved or covered up and forgotten and there I was snacking again and getting fatter… But back to Greece…. It was a bright sunny day… We took a bus to the head of the trail… The deal was we had 5 hours to hike and meet a boat on the other side of the island which would take us back to the beach in front if our hotel. The canyon had no amenities… We had to be back to the boat or sleep on a rock in the canyon… Not an option! So, I started down the canyon… On the well maintained trail made of gravel… This would be cake! ( yum! Cake!) then about a mile into the hike there were boulders… And rocks I had to scramble over… No worries… I can do this! I am as my Dr once told me… A healthy overweight girl… 3 miles in and I’m at the back of the group but I’m keeping up… More rocks and boulders later and a water break and I’m doing ok… It’s hard but I’m keeping up…. Mile 5 and I’m falling behind… My husband is gently prodding me to hurry it up and I try… I really try…. But it’s hot and I’m tired… The next hour my husband is getting a bit more pushy… Reminding me we cannot sleep in the canyon… Come on, hurry it up we need to catch up… I’m getting angry now… Can’t he see I’m doing my best? We will get there no worries! More prodding and now I’m mad… I storm ahead and in my frustration I trip and fall down a pile of rocks… I now have broken 2 fingers and i slid on my face which is now scraped in several places, my nose is bleeding, probably broken, and knees skinned up pretty good…. But I can’t linger… There’s no time… Got to move… After all we “can’t sleep in the canyon” I straighten out the fingers the best I can and wipe the blood off my face and plod on…my husband sees this mess & tries to help but I’m too mad for help… So he goes off to see if we can rent a donkey to get me out of the canyon (yes, there was this option… ride a donkey through the canyon). I don’t want or need a donkey, but I also don’t want my husband near me because I am tired of his nagging to be quite honest! So he goes ahead a mile and asks to rent a donkey. He returns a bit nicer and maybe even humbled. “They say we can’t rent a donkey because they are worried you may hurt the donkey or even kill it.” I think to myself “What? Really? Wow! I’m so fat I may kill small farm animals? Now that is FAT! “. So, I traipse on and we make it to the ends the trail. I’ve got 9 blisters on my feet now and all the other injuries as well. I am looking super pretty! (Think west side story here… I feel pretty oh so pretty…) I might add we had 40 minutes to spare before getting on the boat. This was my eye opener hike. This was, after al,l where I found out I was so fat I would kill small farm animals if I sat on them… I guess I have to do something… Drastic… Like gastric bypass. The decision to have gastric bypass was not an easy one. When I had my surgery it was still pretty new. I had cared for many failed bypass patients in my years of nursing; swearing each time I would never end up having that procedure. So how did I end up deciding this was ok for me? I looked back at all my years of dieting and losing the weight then gaining it back and losing and gaining and losing… you get the picture… and I looked at what I needed to lose (about 100 lbs) and I thought “This is insurmountable. I can’t do this alone, work full time, raise a family of 4 and volunteer as I was doing… and so on and so on…”. I needed help. Trust me when I tell you I don’t ask for help often… if ever. I talked to my Doctor about the surgery and she thought I was a good candidate for the procedure. I was the referred to the surgeon who referred me to the psychiatrist for an evaluation. I had to undergo counseling for 6 months and keep a food journal as well as attempt to lose at least 20 lbs on my own. All of this was to show my commitment to this lifestyle change because bypass surgery ins not just a simple thing… it is forever with tons of risks and you need to understand that you will NEVER eat like you did before the surgery… and that you can die from complications related to this procedure. I thought for a long time I was taking the easy way out but I assure you today, nothing about this was easy. I passed all my tests and evaluations and made my way to Walter Reed in Washington DC for my surgery in November of 2000. I would be away from my family for a month. I would miss Thanksgiving… all that good food! But I was committed to this event. My mother and sister were there with me and I was thankful to have them by my side. I weighted in at 278lbs… I had lost 24 lbs already. I was ready. The surgery went well and I awoke to someone telling me to slide to a stretcher. I thought I was going to surgery not coming from it… so I sat up (always willing to help) and felt pain like no other. I had a full thickness incision running from my chest to my belly button. I had just sat up… the pain controlled me from that point on and it was a long rough night. I didn’t want to ask for meds lest I be thought of as a weenie. But my family asked for me and I was told that I had been medicated and I just needed to use my pain pump (PCA) which I did and still had a lot of pain. But I made it through to morning. The day shift nurse noticed that my IV had come out at some point and I had not been receiving any meds through it… gee, I wonder why I hurt. At that point I thought why bother, I will never get on top of the pain so just go with it. I opted for motrin at that point. I made it. I was moved to the floor and was walking the halls within hours. I did so well I went to my hotel (on the hospital grounds) a week early. I was then able to go home a week ahead of schedule. I remember eating my Thanksgiving dinner on a cargo plane headed back to Germany to start my new life… turkey, mashed potatoes and gravy pureed… ick! I ate pureed food for weeks and progressed on well. Within 1 year I had lost 100lbs. The following year I lost 30. I want you to understand something… my weight is something I deal with everyday. I have joined Weight Watchers since my surgery… I have tried all the fad diets as well… I would like to lose 15 more lbs… I work on this daily. You can’t just have the surgery and expect that it will all go away… it takes work. It takes commitment. I have severe anemia due to my gut not being able to absorb vitamins from the foods I eat. I have had several iron transfusions to help with my anemia. For a while I couldn’t climb a set of steps without feeling short of breath. I always thought it was due to weight, but my hemoglobin was 6.8 and my hematocrit was 22.4. Simply put, I didn’t have enough blood to carry oxygen to my organs. I do better with iron but it is an ongoing struggle. A year ago I read a book called “It Starts with Food”. It was a book that opened my eyes to a new way of living… it was another lifestyle change I wanted to make to improve my health. It was my door into the world of Paleo eating. I decided to give it a try. Let me tell you, it has changed me forever. For the first time in my whole life, I don’t have to think about what I am eating because I know it is healthy and filled with good things for me. I have lost 18 lbs living like this… I feel great. I have no more joint pain, I sleep soundly without tossing and turning, I have mental clarity like never before and I am a lot less grumpy. My nose doesn’t run all the time and my sinuses are clear… and I never realized how crappy I felt until I started eating clean. My son and I eat a paleo diet and I am 27 days into my second whole 30… a 30 day commitment to eating no sugars, no grain no dairy no beans… and I feel great. My son and I often ask each other why everyone doesn’t eat like us because the food is so good! It pains me to see how I used to eat…I wish I had adopted this lifestyle years ago. I urge everyone who struggles with weight or digestive issues or chronic pain to read this book and try this way of eating. I am willing to bet that after 30 days you will feel so much better than you ever thought. I put it in my head that I wanted to do a triathlon. Up to this point I was spinning three times a week and weight training two times a week. I got in touch with a friend of mine who is one of the top triathletes in New England. She started when she weighed 300 pounds now she weighs in at 100 pounds. I used her as my inspiration and began working out in the fall of last year doing CrossFit; which introduced me to the Paleo lifestyle. 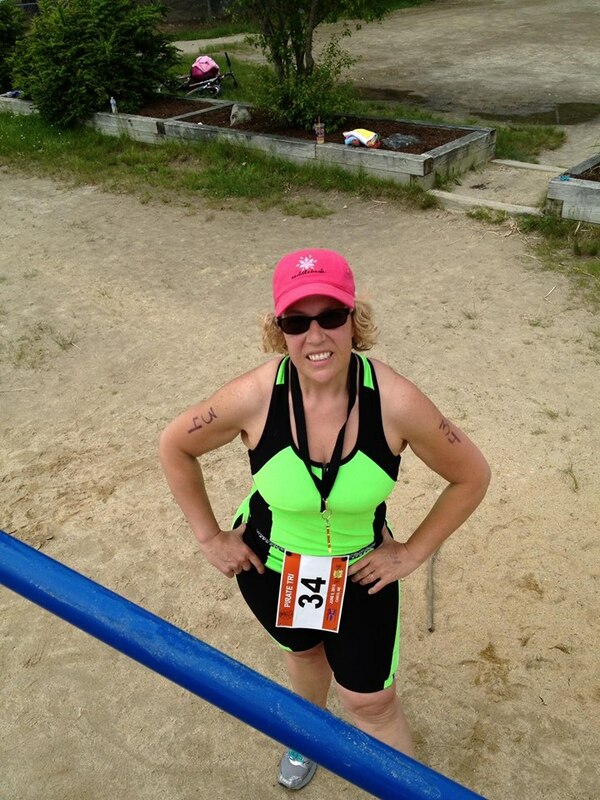 I joined a group of local triathletes, worked with the swim coach and started running (yuck). In the spring pulled out the bike and started to ride. I came up with the training plan and stuck to it. The night before the race I didn’t sleep… I tossed and turned. I thought what have I done; why did I sign up for this… I can’t possibly complete it. Race day came I was very withdrawn from anyone around me, very self absorbed and very nervous. I didn’t talk to anyone at all and when the timer went off to start the race I dug in and did my best. When I finished I thought “well that’s it”…I never need to do one again. I was told by several of the other triathletes that I would be signing up for another triathlon within the next three days… to which I thought they were crazy. But, lo and behold, about 16 hours later there I was online searching for another triathlon. I signed up and unfortunately was unable to complete that one due to my broken wrist. However, I have signed up for one in the spring and also for the tough mountain challenge in August. I am off to read through my cook books and discover new recipes. I urge you to take a few moments and find a place in yourselves to make a commitment to your health. I promise you, if you stay with it… you will NOT regret it. Afterall, you are the one and only person you can depend on. Treat yourself well. An inspiring story. Thank you for sharing Lisa!